On the way to our next resort, we passed roadside wetlands with flocks of egrets, king fishers, sand pipers, and a half dozen other birds I didn’t know the names of. Mark would pull over so Stan, our bird man, could check them out with his binoculars and add any new names to his running list. No one minded the frequent stops. 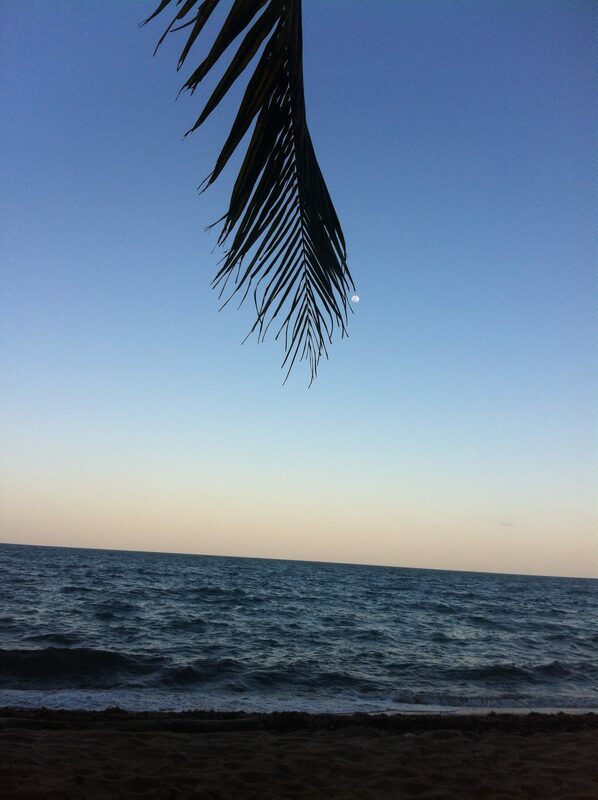 We had been in Belize now for four days and were finally decompressing. This is about average, I have found. The first few days of a holiday you are excited to be there, meeting new people, weighing all the optional activities, adjusting to the heat, food, culture, and then—phoooooooph—like a balloon losing air, you collapse. In a good way. We arrived in the little town of Hopkins. I’ve described how bad the roads are in Belize, the one road in Hopkins was worse than the worst of them. It took us 20 minutes to go one mile, and by the time arrived at our destination I had full-blown heartburn. 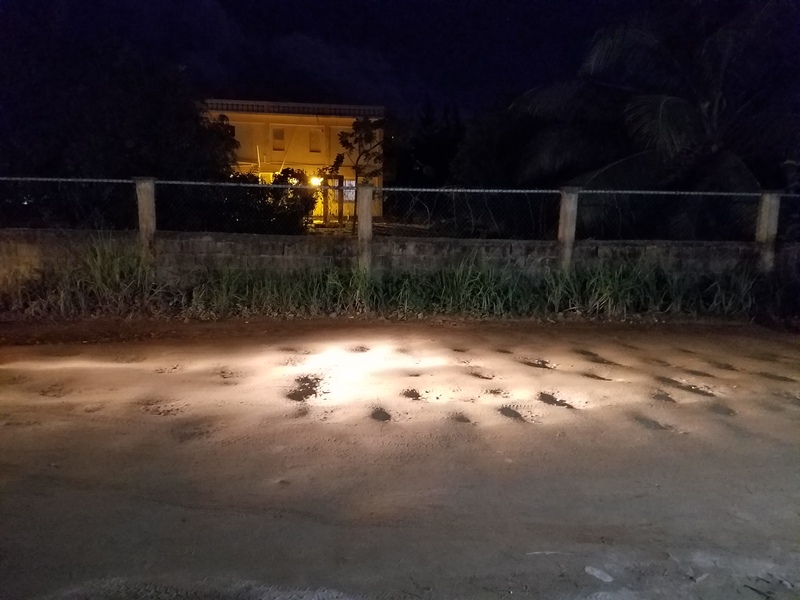 This is a shot of the road at night. It was worth it. 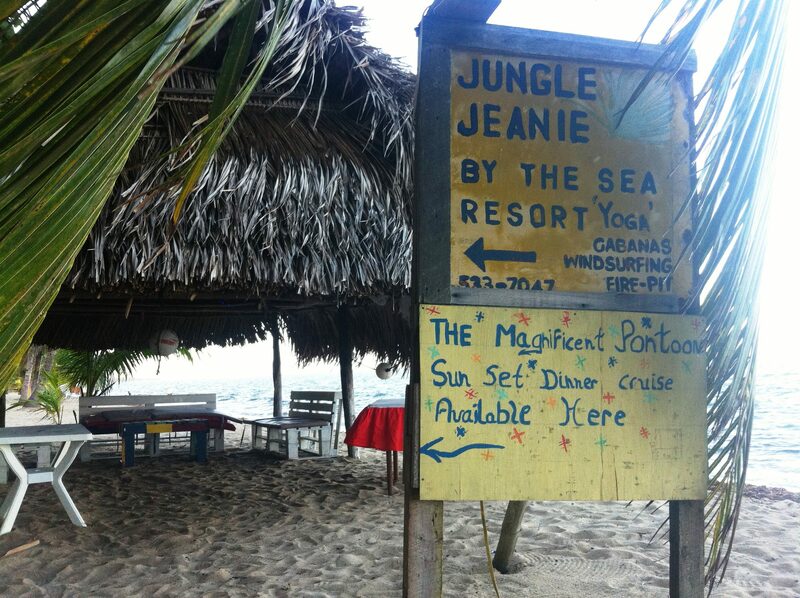 We arrived at Jungle Jeanie’s which is—as the sign says, “By the Sea”—the Caribbean Sea. We hung out in the lodge, which had indoor and outdoor dining areas and a bar. In a few minutes Jeanie appeared. She and her husband had moved from western Canada to Belize 20 years earlier. He had died about five years ago. She appeared to be about 85, frail and tottering but with a game smile that told you she loved what she did. She spoke haltingly, welcoming us and assigning us to our huts, telling us the house rules (joke—there were none except relax and have fun) and offering us a welcome drink of fresh mango juice. Jeanie had a staff of Belizean cooks and bookkeepers and handy men who had been with her for many years. “We’re like a big family,” she said. At Jeanie’s I would not be sharing a room with Liz. I would be sharing a room with Liz and Trudy, our deaf companion, and her interpreter Emily. I made a beeline for our hut but Trudy and Emily had gotten there first and staked out their beds. If you have any physical handicap, Jeanie’s would not be the place for you. First you walked across uneven paving stones set in shifting sand to get to the hut. Then there was a set of stairs to get to the first floor. If you got stuck up in loft as I did, that required climbing a very steeply pitched ladder and heaving yourself over a low wall. I realize this is far from the worst “problem” in the world. However, I immediately imagined myself falling backwards off the ladder in the dark. Liz and I would be sharing the loft, a low, slant-ceilinged space with two mattresses on the floor that was hot as hell. Liz had snagged the mattress near the ladder and I refused to play the game of “I don’t mind which one I sleep on.” I would have to crawl over her to climb down to the bathroom. Others among us were unhappy with the arrangements. 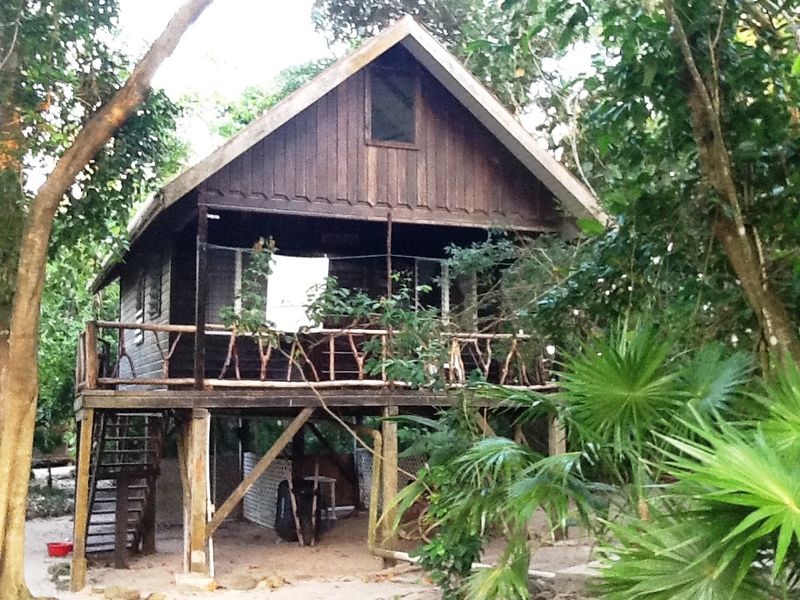 Inga and Jesse had been assigned to share a romantic one-bedroom cottage on the beach with Mark, our leader. He had a cot on the porch and would have to walk through their bedroom to get to the bathroom. Stan and Stacy, who were married but not to each other, had been assigned to a one-room cottage with two twin beds. Words were said in private. Perhaps some money exchanged hands. The beach cottage dwellers were reassigned but Liz and I were stuck in the loft. Liz and I shrugged and laughed and agreed it would be an incentive to spend as much time outdoors as possible. Night had fallen. There was a full moon. Life was good. This entry was posted in Adventure, Budget travel, Culture shock, International Development, Living abroad, Travel and tagged Belize, travel on May 16, 2017 by Breaking Free.